Cllr Chris Blakeley said there was a piece of work being undertaken by the Scrutiny Programme Board to look at the work processes and how flows and blockages were happening. Ken Harrison said he would like it minuted if ok, asking if they had the manpower with sufficient staff or was it the case that existing staff were not capable? He had listened to this “time after time”. Bill Norman said it was “part capacity and part priorities”, however it would have “a higher priority than hitherto”. Cllr Chris Blakeley asked about enlisting the help of other authorities to speed it up? Brian Cummings said it shouldn’t be taking two to three years to deal with the public. There was no other business raised by committee members so the meeting ended. Since the meeting the agenda on Wirral Council’s website has been reordered to remove item 6. Therefore agenda item 7 has become agenda item 6. The report for this item can be read here with the appendices here. 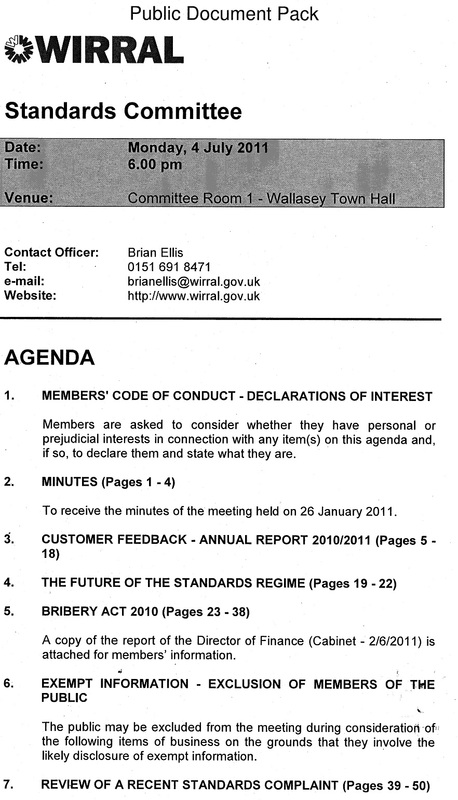 Please note this blog post uses the original numbering of agenda items, not the changed agenda that Wirral Council changed a day after the meeting on their website to remove item 6. The public may be excluded from the meeting during consideration of the following item of business on the grounds that they involve the likely disclosure of exempt information. The grounds given were paragraph 7c of Part 1 of Schedule 12A of the Local Government Act 1972, however as you can see here by reading the legislation there isn’t a paragraph 7c.